Villa Gouverneur Cliff St Barts. Long known as one of the best beaches in the Caribbean, Gouverneur Beach is truly beautiful, and because the Villa Gouverneur Cliff sits just above it in the hills of St. Barts, it makes for a fantastic holiday destination. With its western orientation, the three-bedroom property also promises gorgeous sunsets each day. Of course, the scenery, sea breezes and hillside setting are just part of the appeal, and this villa also provides an array of appealing amenities that make it a fantastic find. The pool deck is but one such amenity. With its unusual, curvaceous shape, it is wrapped by a wooden deck furnished with an array of cozy sun beds. Along one edge, a soothing row of native palms offers just the right touch of nature. Steps up from the pool area is the large, covered terrace. Here you can relax in style or dine at one of the different niches. This terrace opens into the main living level. Done in an appealing and soothing palette of cream, stone and shades of sand, it features the comfortable living room area that opens to the formal dining suite. This is adjacent to the breakfast bar which faces into the lovely, gourmet kitchen. 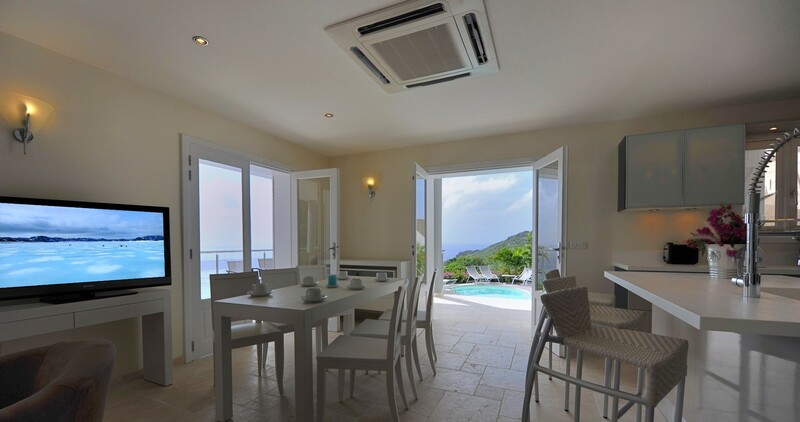 Fitted with the latest and best appliances, it looks out to the views, ensuring you don't miss a thing. 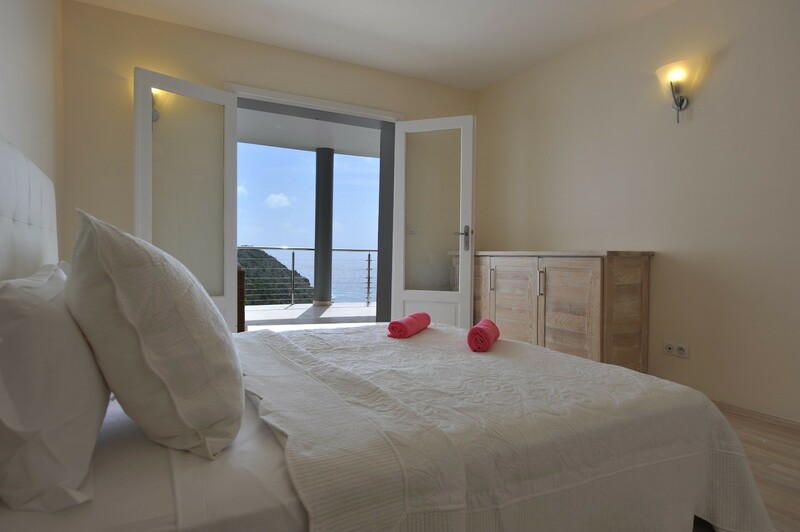 The three bedrooms use the same low-key palette with aged wooden doors giving a distinctly artisan feel to each suite. Spread out over upper and lower levels, two feature the classic high white ceilings of Caribbean architecture, but are energized with blonde wood floors and direct access to terraces. There are two upper level suites. One is a queen and one king. Both feature entertainment systems and premium ensuite baths. The lower suite is a king suite with ensuite bath as well. Perfect for a set of friends or a family, the Villa Gouverneur Cliff provides a one-stop destination or unforgettable base for an island adventure.